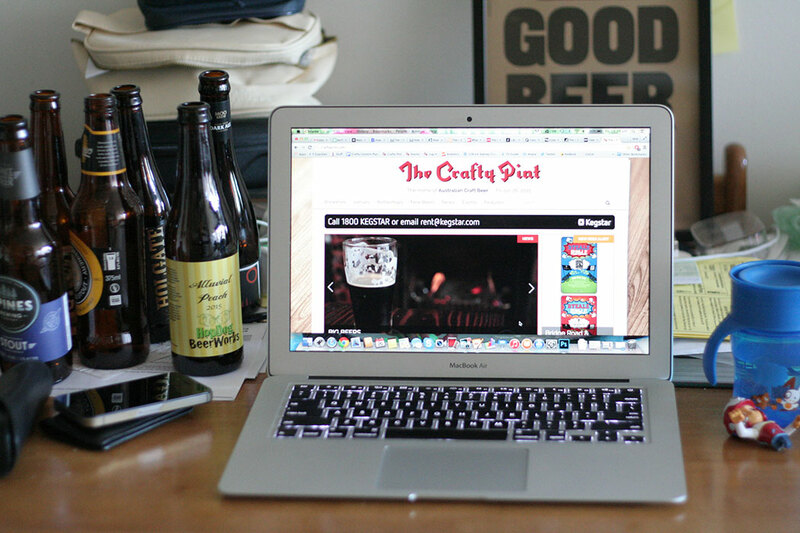 Blog: I try to keep tabs on the NSW beer scene for The Crafty Pint, as well as keeping other parts of the website ticking over. Besides that, I do a few beer labels, websites, etc, whenever someone can’t find the right words themselves. I’m suppose I’m like a backup singer, adding a little flourish to things but mostly keeping out of the spotlight. Established: I think Crafty has been going since 2010. I’ve been helping out for around three of those. Because I wouldn’t have been a very good brewer. I’m no good with early starts and I’m as weak as a child so lifting all those sacks of malt would be a bit tough. The idea of writing seemed like a much better option: wake up whenever, drink beer in your dressing gown, bash out a few tasting notes then wander down the pub to spend the evening sharing hilarious anecdotes with strangers. Turns out it’s not exactly like that – for starters, I don’t own a dressing gown – but I love it all the same. What else can I say? Sometimes in life you just stumble into something that feels right. I suckle from the corporate teat every now and then to pay the rent, but writing about beer is where I get my real nourishment. That and my son. I don’t want to come across as biased, but I’m pretty sure he’s the world’s greatest human. Watching him grow and learn things is endlessly wonderful, fulfilling and very levelling. I do get paid a bit. I’m not rolling in it to the point where I’m pouring Clout Stout on my Weet-Bix every morning, but we can afford the Weet-Bix so that’s a start. That aside, I think what Crafty’s built is quite special in the way it focuses only on what’s happening at the smaller end of the beer industry and is relentlessly positive in the way that’s covered. It’s become something of a cheerleader for the industry while maintaining its independence, so I think it’s respected for that. Those are things I hold in high regard anyway, so I’m happy to help it continue to grow. If anything, the problem isn’t about what keeps me writing but what’s been preventing me from writing more. Having shuffled a few things in life around of late, hopefully that’s been resolved and we can start feeding the site more regularly and with stories of more substance – we only post original content and she’s a pretty remorseless consumer of it. There are passages and lines I think have been pretty clever but in terms of a whole piece I’m completely happy with, I haven’t managed that yet. I still feel that I’m quite new to this whole writing gig and it’ll take a while longer before I find my voice and am properly comfortable with what I’m doing. Maybe it’s like that ‘‘10,000 hours’’ thing people talk about before you really get good at something. That’s not to say I think everything I do is a pile of crap. A great deal of effort goes into what I do and I feel like I’m improving, but I think it’s important to be a little critical of your own work so you can figure out ways to push yourself. Besides, if part of what you’re doing is banging on about demanding better quality from brewers, the least you can do is look in the mirror and ask if you could be doing better too. The secret ingredient is… love. I didn’t pass English at school, failed my first two attempts at University and haven’t done any formal training as a writer, but here we are. Once you find something you really love doing and immerse yourself in it, the rest of the stuff hardly seems to matter. Trying to be a nice person helps a bit too. How far there is still to go. When you’re in it every day, you can get comfortable in this little bubble where everyone drinks amazing beer and talks about a hop shortage like it’s Doomsday. Then the bubble bursts and you find yourself in a random pub in the outer suburbs getting strange looks from some musclebound gold chain-wearing dude getting wankered on jugs of Toohey’s New. There’ll be plenty of people who’ll never be interested in what’s happening in the craft beer world, which is cool, but I’d say there are a lot who would be if they’re given a glimpse into how interesting it is. Hopefully we can find a sweet spot somewhere between the bubble and the ‘burbs and get those people involved. I’m not much of a hater. No industry is perfect, but ours is full of beer and pubs and awesome people so all things considered there’s not much to complain about. The phrase ‘Craft beer’ – love it or hate it? ’Tis what it is. Things get labels and craft is what we’ve got. It sure is becoming a murky pool though, particularly with the big brewers’ little brands. To me that comes across a bit like offering the antidote with one hand while administering the poison with the other. Anyway, should be some interesting times ahead in the craft and craft-ish beer industry.